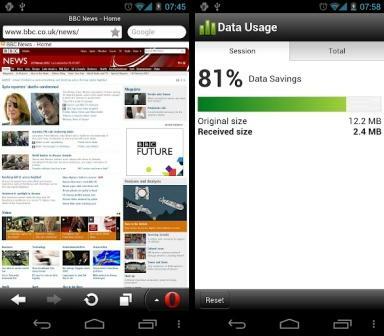 Opera Software launches Opera Mini 7 Web browser final for Android platform. Opera Mini 7 for Android makes browsing faster and smoother, since hardware acceleration has been improved. When compared with the previous version, Opera Mini 7 for Android brings the increase in the Speed ​​Dial feature is located on the Home Screen. Now in the feature, users can add as many sites as they want. Opera Mini 7 compresses Web page of the network on your phone. Up to 90% of the original data will be compressed, not only uses less data, but also allows you to access the Web more quickly.